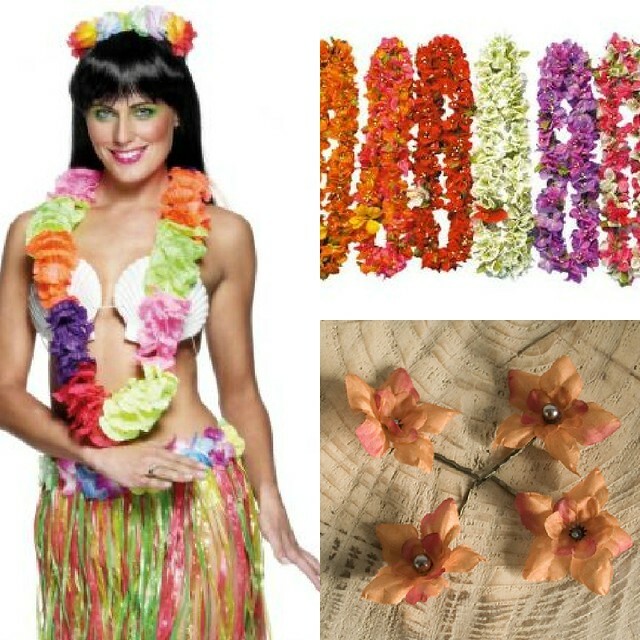 When my friend announced that she wanted to have a Hawaiian fancy dress theme for her birthday I went into a panic. I had images in my head of coconut bras and grass skirts and broke out into a cold sweat. I'm a pretty confident person but I wouldn't go as far to bare my flesh on the streets of Cardiff. Some of my mates are going down the traditional route like the photo below but I suppose I get a lucky escape because it's hard to find plus size party dresses for fancy dress as they tend to be 'one size'. I want to not be a bore and get involved in the theme so I'm going to find some items that are more 'me' but still mean that I will fit in with the group. I'm going to get involved with the theme by getting some garlands which I have picked up cheaply on ebay and I'm looking for some floral hair clips and I've found some pretty ones in the sale on Crown and Glory. I'm sure I will use the hair clips again, I hate buying things just for one occasion. I decided to buy a tropical print dress from Primark which fits in with the theme but would also be perfect for a summer party or it take on holidays. I love the bold print and bright colours and I think I'm going to enjoy wearing something other than black for once on a night out. The earrings would be a fun touch and you can pick up ones like there for a few pounds in places like Claire's Accessories. The shoes are so fun and bright and are a bargain at under £20 from New Look, you can get them lots of different colours like pink and orange. I'm going to dig out some blue eyeliner and pink lippy and go a bit mad on the make up too. Do you dread fancy dress nights out or do you fully embrace them? lots of bright colours sounds like the best idea :)thanks! I always try and do fancy dress this way as I hate having mountains of tack that I will never wear again- as nice as a coconut bra may be, it is never going to be office wear! No matter what size you are, buying nice clothes is always a smart move & I think you're going to look bloody awesome. Superb!Theses design are looks very nice.I think its a good outfit for Halloween.